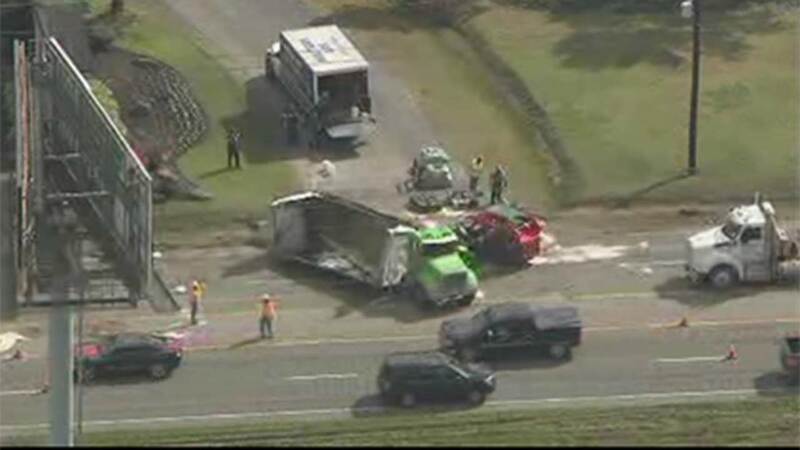 HOUSTON (KTRK) -- The Texas Department of Transportation says the eastbound lanes of FM 1960 near Woodland Hills Drive was shut down after an accident involving a battery transport truck caused an acid leak on the roadway. The wreck happened around 2:30pm and affected all eastbound lanes of FM 1960. Crews were hoping to have it reopened by 5:30pm, but said the cleanup took longer than expected and didn't reopen until later. We don't know the circumstances of the accident or whether any injuries were reported. Hazmat and Harris County officials were on scene monitoring air quality and environmental quality as cleanup continued.